Optical vs. Digital Zoom - What's the Difference? Today we’re going to discuss why there are two different types of zooms on your camera and what it all means. It’s the classic Optical vs. Digital zoom throwdown, so dust off that trusty lens and head on downtown to Magnification Heights. Nearly every consumer digital camera or camcorder has an Optical Zoom and Digital Zoom combination. The Digital magnification is always a higher number than the optical number, and there’s a reason for that. 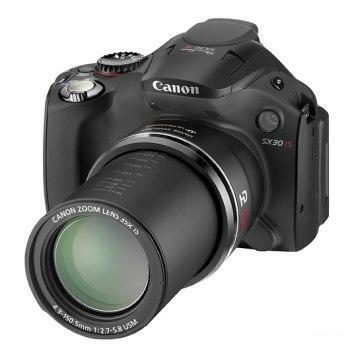 Have you ever taken a Super Zoom camera like the Canon PowerShot SX30 IS and toggled the Zoom control only to watch the lens extend so you can make an obscene joke about it? When a camera or camcorder executes an optical zoom, it means the lens is physically extending, altering the ratios of internal lenses, thus shifting the focal length. So, what you are witnessing is a true optical zoom, which does not alter image quality because it is merely the optics that are being toiled with. Then, there’s that pesky digital zoom, which usually picks up where the optical zoom left off. For instance, when you watch the magnification bar climb on an optical zoom and transcend its peak, there’s a different colored portion of the bar that begins to fill up. That yellow or blue or red portion of the bar is the digital zoom in action, usually climbing much higher than the optical zoom can manage. You’ll notice that the lens is not moving while the digital zoom is in action, and that’s because the process is entirely electronic. What’s really happening during a digital zoom is that the camera is cropping the image and interpolating the pixels as it climbs closer. Interpolation means that the pixels are being digitally recreated within the camera in order to reach higher magnifications, ultimately sacrificing image quality to a dreadful degree. In my opinion, the digital zoom is completely useless on a camera. The dip in quality is not worth the extra magnification, unless you’re a stalker or a Russian spy. Whenever I test a new camera, I rush right into the Function menu and disable Digital Zoom. Most cameras these days will ship with the digital zoom defaulted to On, so you will use it without knowing it—until you get back home and notice the deplorable image quality. Digital Zoom used to be a prime selling point on camcorders, flaunting 1000x digital zooms that lured consumers like kindergarteners to a fountain of Pixi Sticks. But Flava Flav said “Don’t Believe the Hype” and over the years consumers have become privy to the Digital Zoom conspiracy, much like the Megapixel Conspiracy within the recent years. That still leaves smartphones, which only offer digital zooms at ridiculous 1 x or 2x magnifications. While the image quality on smartphones already suffers without a zoom, make sure you don’t touch it at all. In fact, I wish the digital zoom could be disabled on phones. Has anyone here ever inadvertently recorded something with a digital zoom? Tell me what you saw.